I ended up starting Ruth Bacheler over also. I tried to be happy with DMC threads I was using, but every picture I saw with the silk threads really made me wish I had gone with them. So I gave in. I got the silks and started over last night. I'm very happy with how it's turning out! I'm on book three of the Twilight Saga now. I'm really enjoying it. I watched the movie the other day. It was pretty good also. Not as good as the book, but I half expected that. A friend of mine said it was terrible, so I was actually expecting a lot worse. I didn't think it was terrible. Well, I've got to get the boys from the bus stop. Write later! YGG on the restart, Nicole! I think it's better to go with what makes you happy, and you've already made nice progress. Love your Houses, too! I'm going to have to give silks a try one of these days. Beautiful stitching! Oh you make me laugh with your restarts, Nicole. Because you just seem to then stitch even faster! I agree with Siobhan's comment - you gotta go with what feels good to you. Everything looks wonderful. It's good you got rid of the DMC's if it wasn't making you happy. Silks are always wonderful to work with! I give you a lot of credit for restarting. I'm one of those people that will throw the offending piece aside and go on to something else. Love your Houses too! I am sure that you will be really happy with the silks. I think silks always give such a better look to stitching. I love the colors on your restart. They are really lovely! I didn't think the movie was that bad either. I liked the books a lot but haven't watched my DVD yet. I love those silk threads as well as the NPI silks I am using on my Shores of Hawk Run Hollow. I hope to get a post up maybe tomorrow. I worked on QV and now I am finishing up the grass on SOHRH. Your stitching is beautiful as always on these! Now your Ruthie looks like mine! lol! I love the silks -- it's definitely worth a restart rather than regretting it later. I restarted HoHRH after finishing the first 3 blocks -- and that was a bummer! And speaking of, it's looking great too! Both of your WIPs are gorgeous! I love silk floss. I'm happy you decided to go with what you like. 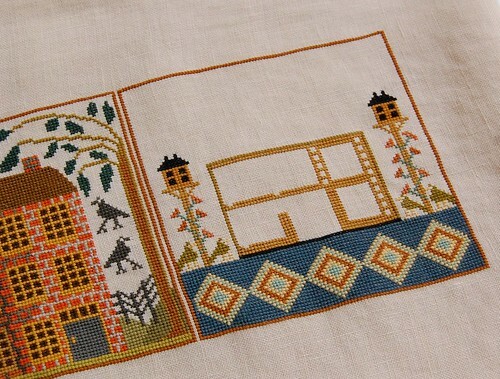 The sampler is such a beautiful one, and not to be happy with your finish work would be a shame. Look forwad to following your progress. your progresses look great. I read the whole Twilight series and enjoyed them. I watched the movie Sunday and thought they did a pretty good job on it. DS#2 and his girlfriend liked it and my son didn't think he would like it. Great progress on both Nicole! Your pics always come out so nice! The RB one I had not seen before so I googled it and went for a peek at the finished sampler. My there is a lot of work in that but it will be stunning when its done. Very pretty! Love it in the silks too. Your HRH piece is coming along well too. There is nothing like those silks. :-) It's beautiful! Oh the silks look wonderful!! Restarts are so necessary sometimes, to bring the result that we want. Love your Houses too, just beautiful! Great progress on HoHRH, Nicole - it's coming along beautifully. Nice re-start on Ruth Batchelor - I'm glad that you're happier with the silks - I love the look of silks, but hate stitching with them, because the silk always ends up snagging on my dry hands. Beautiful progress on the re-start! It is looking just fantastic so far! I think it looks great either way, but totally understand the need to restart! Glad you're happy with it. Silks are always a pleasure to work with. I also love DMCs very much but it's not good to continue a project with threads that you don't like working with. Both your WIPs look really great. What did you think of New Moon? I'm half way through - how depressing. I'm finding it difficult to get through bc I want so badly for Bella and Edward to be exactly where they were at the end of Twilight, only with Bella being a Vampire and their love to keep exploding. There is a lot of talk online about the filming of New Moon.